Over the weekend I entertained a few friends and made a large pot of this hearty and rustic chili, a warm welcome when the cool days of late autumn arrive. 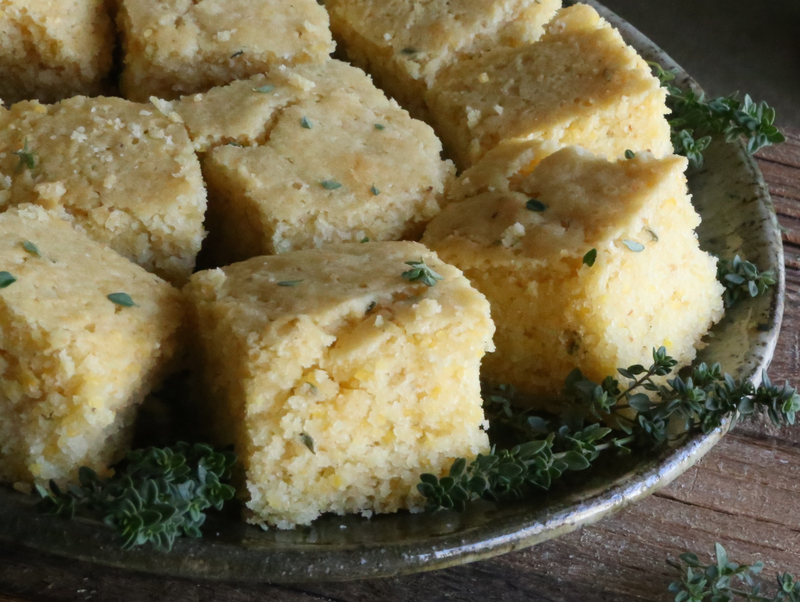 To make it a full meal, I served this chili with moist cornbread—a slightly sweet family favorite made with stone-ground corn and flavored with a hint of lemon thyme—the two compliment each other quite well and provide plenty of nourishment with their comforting flavors. Mildly spiced, this chili is perfect for causal dinners with friends or everyday meals. 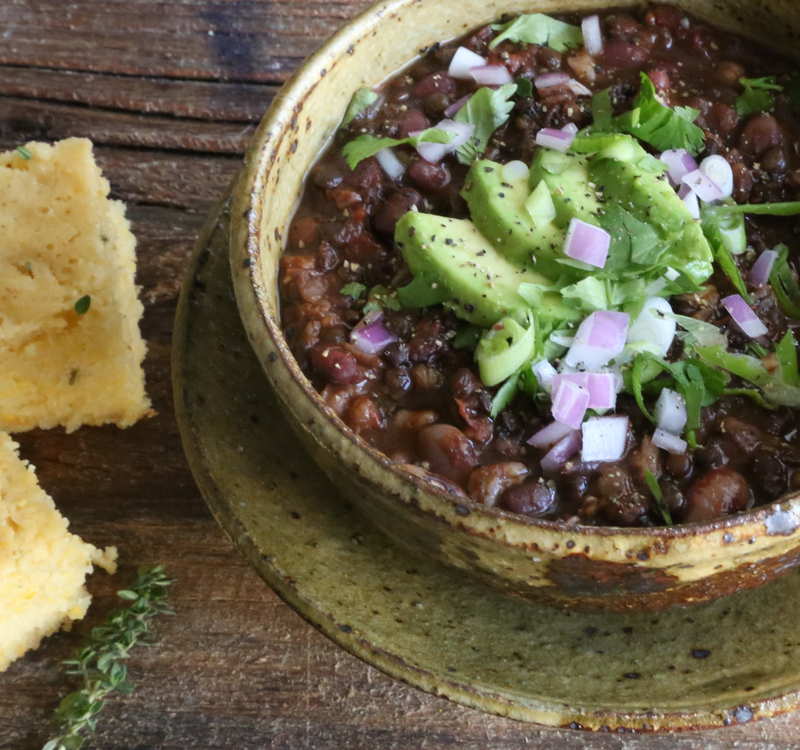 The chili consists of a jumble of legumes and grains—black Beluga lentils, two types of beans (azuki and anasazi beans), oat berries and barley. The combination of textures and flavors came together in beautiful, rustic simplicity. Shiny, deep red, and nutty in flavor, azuki (also known as adzuki) beans are considered the most digestible of beans. I used Japanese Hokkaido azuki beans. 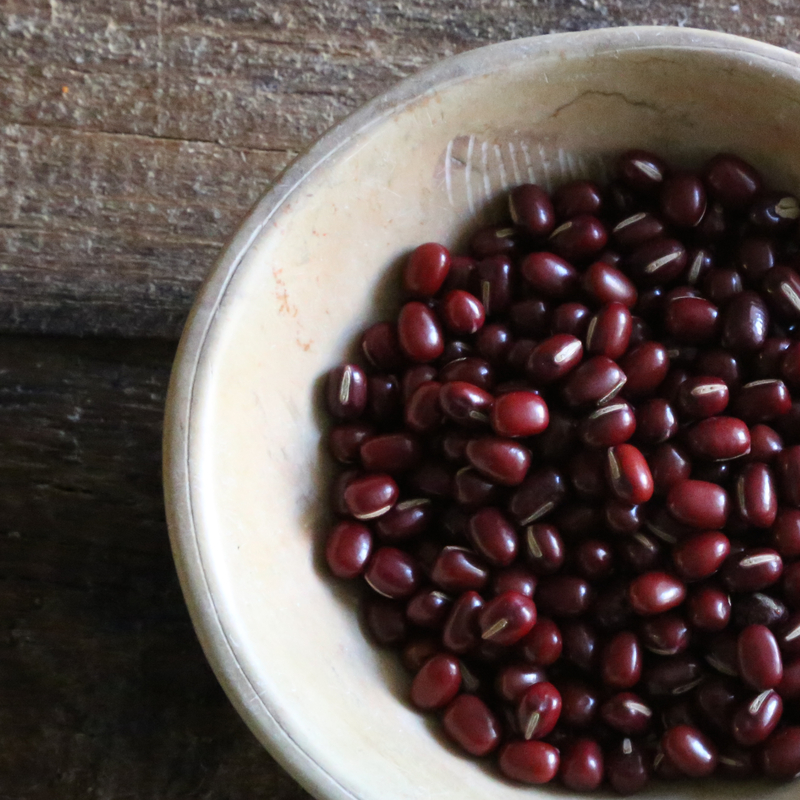 Grown in the rich volcanic farmland of Hokkaido, Japan, azuki beans grown there are said to be larger, sweeter, and better-tasting than any other azuki in the world. In Oriental medicine the azuki is reputed to have properties useful for healing kidney disorders. Azuki beans are a good source of phosphorus, potassium, iron and calcium, and contain some A & B vitamins. They also have the best carbohydrate-to-protein ratio of the colored beans. 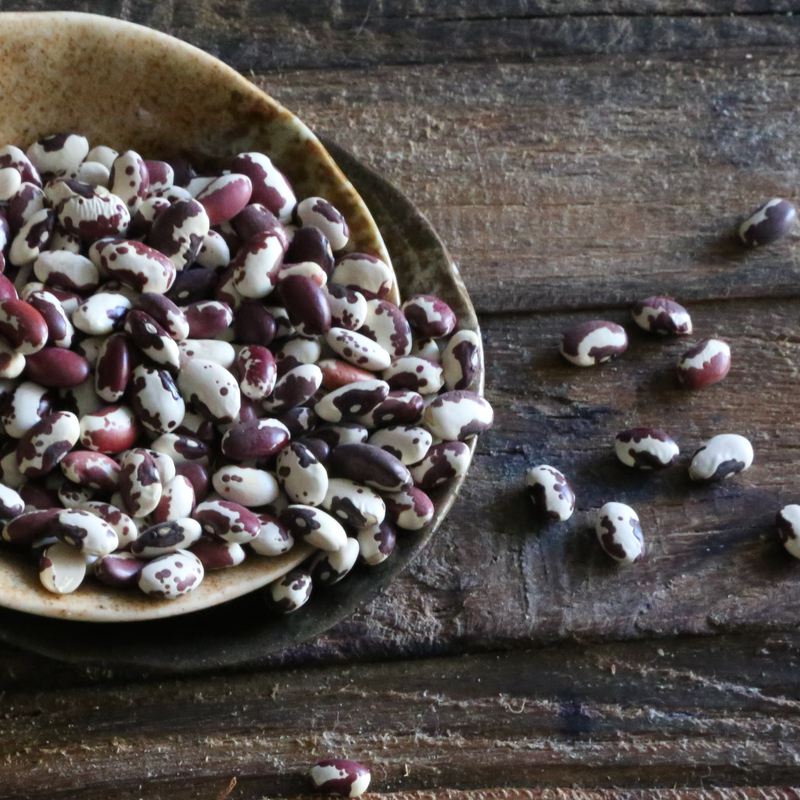 Full flavored and mealy in texture, anasazi beans are perfect in any dish calling for beans. The Anasazi were cliff-dwelling native Indians who inhabited the Southwest dating back to 130 A.D. Anasazi is a Navajo word perhaps best translated as “the ancient ones”. Beautiful and nutritious, anasazi beans were one of the few crops cultivated by the Anasazi. An unusually tasty bean, they require no presoaking, cook in about 2/3 the time of most other beans, and are said to contain about 75% less of the gas-causing carbohydrates compared to pinto beans. Both beans are not only tasty, but also an excellent source of fiber, protein and iron. I purchased both beans locally. The brands of azuki and anasazi beans I used are Gold Mine Japanese Hokkaido Azuki Beans and Bob’s Red Mill Anasazi Beans, respectively. If you can’t find either of them locally—packaged or in the bulk section of your local health foods grocery store—you can purchase them online. Chewy whole oat berries (also known as oat groats) provide a slight toasty sweetness and I used an ancient grain called Japanese Hato Mugi, also known as Job’s tears, that resembles large barley. Hato Mugi adds flavor and body to soups and stews that require lengthy cooking, such as Split Pea Soup. I also found this ancient grain locally. If you can’t find it in your area, you can purchase Hato Mugi online. Or, whole grain barley or pearl barley would also work well as a substitute. Although this chili is mild, the ancho and chipotle chilies do give it a bit of a spicy kick, but if you want to take the heat up a notch or two, you can easily add a habanero pepper to the pot. If you don’t want it spicy, reduce the amount of chilies. Also, I added a bit of cocoa powder to lend a bit of darkness and depth to this hearty chili. Put azuki and anasazi beans into a large pot and cover with water. Liquid should be about 2-3 inches above the top of the beans. Bring to a boil; reduce heat and simmer until beans are tender, about 1½ hours. Season with salt and set aside. In a very large pot, heat olive oil over medium heat. Add onions, garlic, ginger, chipotle chiles, ancho chile, cumin, sun-dried tomatoes, bay leaves, thyme, oregano, salt and pepper. Cook, stirring often until onions are soft and translucent, about 5-8 minutes. Add tomatoes stir for another 3 minutes. Add beans and their cooking liquid, lentils, barley, oat berries and 4 cups water. Bring to a boil; reduce heat and simmer until the beans, lentils, and grains are very tender (almost mushy) and all the flavors meld together, about 1-2 hours, maybe longer. Stir occasionally, adding more water if necessary. When chili thickens, add wine vinegar and cocoa. Taste and adjust seasoning, adding salt, pepper and more chiles if desired. Remove bay leaves and thyme sprigs. Ladle into bowls and top with red onions, green onions, cilantro, and sliced avocados seasoned with fresh lime juice, olive oil, salt and freshly ground pepper. Serve with cornbread and you have a full meal. Notes: Like Beluga lentils, green lentils—French or Puy Lentils—continue to hold their shape when cooked. So if you can’t find black lentils, use green ones. Other grains I considered using that could also work well in this recipe, instead of the ones used, are barley, kasha (roasted buckwheat), bulgar, and farro. Preheat oven to 350F. Grease an 8-inch square baking dish with coconut oil. In a large bowl, combine cornmeal, flour, sugar, baking powder and salt. Add coconut oil, melted butter, eggs, plant milk and thyme (if using). Stir thoroughly. Pour batter into prepared baking dish. Spread evenly and bake until a toothpick inserted near center comes out clean, about 30-35 minutes. The top should be golden and start to show some cracks. Allow to cool slightly before cutting it into squares. 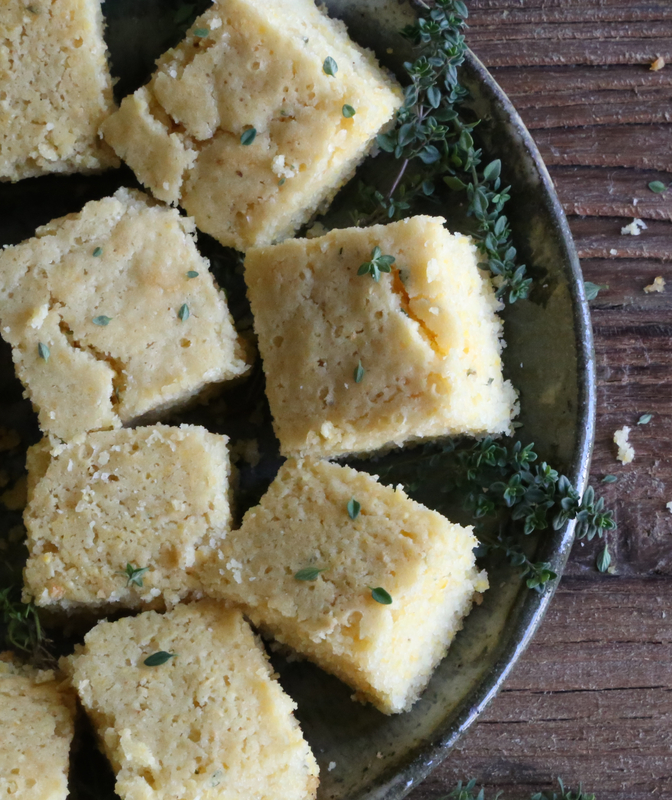 Notes: You can use any cornmeal, but stone-ground cornmeal tastes best and gives a nice little crunch in texture. Make sure your eggs are at room temperature, else the coconut oil will harden from the cold. I’d love to try this chili, Martine! Where do you find the two beans? And the Job’s tears? I love knowing about different beans–especially beans that digest well–and grains! Thanks Josephine! Great questions. I just updated this post to include more information about each of the beans and where to purchase them. I bought my beans locally, but if you can’t find them near you, they are available online. I hope that helps. Let me know if you have more questions!